"I saw a recipe for baked radishes in a magazine long, long ago and the thought so intrigued me I just had to give it a try. This is my personalized version of the original. I often switch out the thyme with either rosemary, basil, or crushed garlic, depending on my mood and what main dish these will be served with." Preheat oven to 450 degrees F (230 degrees C). Line a baking sheet with aluminum foil. Cut radishes into halves; cut any large radishes into quarters. 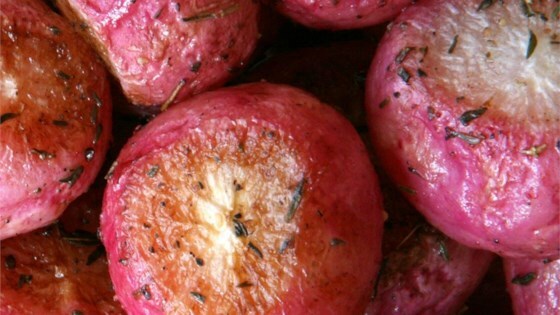 Stir olive oil and thyme together in a bowl and toss radishes in mixture to coat. Spread radishes onto prepared baking sheet; sprinkle with salt. Roast in the preheated oven until tender but firm in the centers, tossing every 5 minutes, 15 to 20 minutes. Drizzle with lemon juice. Okay fresh. Not good left-over. Excellent side dish. You can also add the greens at the end to wilt them in for a bit more sweetness. This was interesting. I used black radishes and lime instead of lemon. Next time I will use lemon, as the lime was too strong. Thyme is a great compliment. Thank you. I did do a minor tweak I put these into a foil packet and BBQ. Boy were they ever good. Will be doing again.